reThe New Orleans City Council will consider a motion that could result in a ban on the issuance of two types of licenses for short-term rentals in the most popular neighborhoods. Another motion will repeal a study now underway by the City Planning Commission about the effects of short-term rentals and replace it with a new study. A motion proposed by Councilmembers Kristin Gisleson Palmer, Joe Giarrusso, Jay Banks, Jared Brossett and Jason Williams would direct the City Planning Commission to consider a one-year ban of licenses in the Central Business District and “Historic Core” and “Historic Urban” zoning districts. Those two types of zoning districts include the parts of the city that are most popular with tourists, including Bywater, Faubourg Marigny, Mid-City and much of Uptown. The license categories targeted for a ban are temporary and commercial licenses. Both allow owners and managers to offer entire houses and apartments on Airbnb and other short-term rental platforms. Temporary licenses, which are allowed in residential, commercial and mixed-use districts, cap rentals at 90 days per year. Commercial licenses, which can be granted in most commercial and mixed-use districts, allow a property to be rented year-round to tourists. That would leave only one type of short-term rental license: accessory, which can be issued only to a homeowner with a homestead exemption. That license allows for rental of a portion of someone’s home or half of a double if the owner lives on site. The motion would prevent the issuance of new commercial permits and the renewal or issuance of new temporary permits. * The short-term rental law went into effect in April 2017, so many of the one-year licenses are up for renewal now. That law was initially hailed as a model of cooperation between short-term rental platforms and cities, but critics complained that it was too lax. 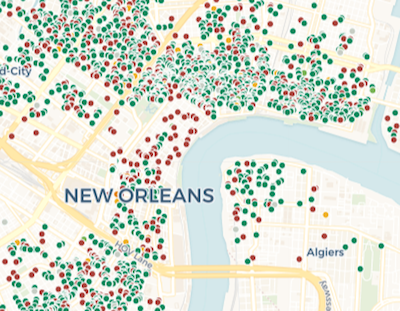 The city now allows short-term rentals anywhere other than most of the French Quarter, and there is no limit on how many licenses a single person can hold. Jane Place Neighborhood Sustainability Initiative, an affordable housing group, found that a disproportionate number of short-term rental properties were controlled by high-volume operators. What’s more, the practice has taken rental units off the market in parts of the city that were already gentrifying, pushing up rents and further straining low-income renters, according to affordable housing advocates. “I think it’s a sensible proposal now as we’re trying to determine the best steps forward to make sure our neighborhoods are not overrun with short-term rentals,” Breonne DeDecker, program manager for Jane Place, said of the proposed ban. DeDecker said the council should also license the short-term rental platforms themselves. Those licenses should require that companies share complete data about their customers and make sure they remove any unlicensed home listings. About 73 percent of the approximately 4,500 licenses are commercial or temporary. It was not immediately clear how many of them are located in Historic Urban or Historic Core districts. The planning commission would have to hold a public hearing and vote on whether to recommend the ban before coming back to the council for a final vote. Eric Bay, the head of the Alliance for Neighborhood Prosperity, the leading advocate of short-term rentals in the city, said the council should wait for the results of the current study before considering any major changes. He noted that the study will be due in about six weeks. But another motion filed with the City Council Clerk’s Office would rescind the ongoing study and call for a new one that looks at what other cities have done to regulate short-term rentals. The motion calls for city planners to look specifically at Charleston, South Carlina; Nashville, Tennessee; Austin, Texas; and Savannah, Georgia. All have placed stricter limitations on the practice than New Orleans. If the motion passes, the planning commission would have 120 days to complete a study. Palmer, the motions’ lead sponsor, and Giarrusso both won office last year after campaigning for stricter short-term rental laws. Neither responded immediately to requests for comment. *Correction: As originally published, this story stated that the motion called for banning renewals of both types of licenses. Renewals of commercial licenses would be allowed.